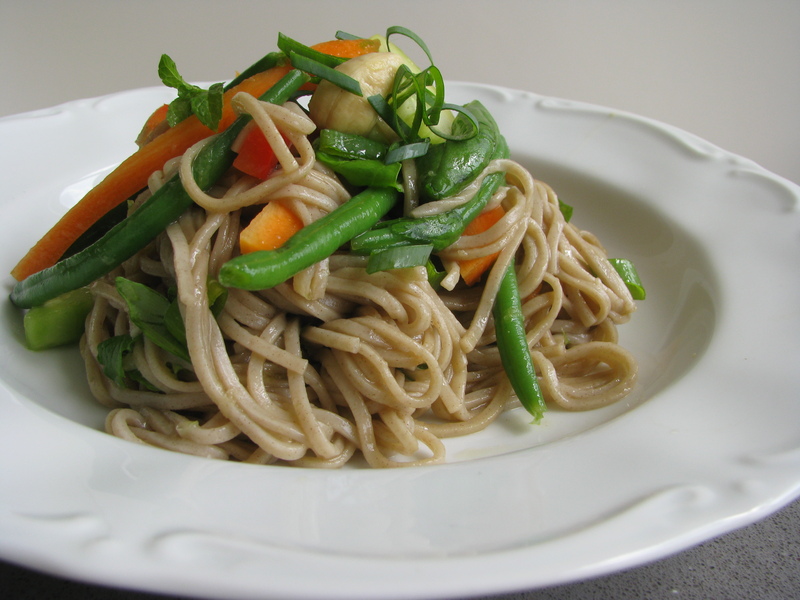 Vegged-up noodle salad | Fork off, heart disease! Hugh Fearnley-Whittingstall is more renowned for his love of meat than veg. But recently, he decided to scale back on his meat consumption and eat more vegetables. They made a TV series out of it as well as a book. Since we do not live in the UK, my good friend Bas lent me the series on DVD and we enjoyed it immensely. Most of the recipes have dairy but many are vegan, which you can find here. As I am making more salads for our lunches, I decided to give his herby, peanutty noodly salad a go. I also wanted to up the veg content cause, you know, I like my veg! You´ll likely have to play with the dressing quantities. I found myself adding a wee bit more soya sauce than was called for. I also omitted the oil. Since my husband hoovered all the peanuts in the house, I used roasted cashews instead. When using thai noodles, cook them and beans in boiling water for about 3 minutes, or until the noodles are cooked and beans still have some crunch. Drain in a colander and refresh under cold running water. For other types of noodles, follow the instructions on the packet. Put the rice wine vinegar, soy sauce, sesame oil, lime juice and zest, garlic and chilli in a large bowl and give everything a good whisk. Add the drained noodles and beans to the bowl and give everything a good stir to ensure everything is evenly coated. Add the cucumber, spring onions and any other veg to noodles and toss, then add the chopped herbs and give another good stir. Crush the peanuts (or whatever nuts you are using) with the back of a spoon. Plate the noodle salad and sprinkle with the toasted nuts.